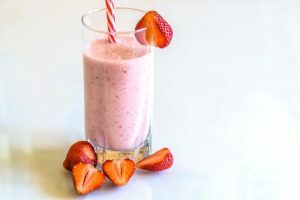 Strawberry “milkshake”: make a sweet, pink, and healthy treat with frozen strawberries, plain Greek yogurt, 1 tsp. vanilla extract, liquid of choice (ex: water, milk, unsweetened almond or soy milk) and a frozen banana. Instead of using added sugar to sweeten, the banana gives a great texture and comes with additional nutrients and fiber. Strawberry spritz: blend frozen strawberries, pour into wine or Champaign glasses. Fill glasses with seltzer water (suggested flavors: unflavored, grapefruit, cucumber, or tropical blend). Garnish with sliced strawberries. Heart-Shaped Pancakes: making pancakes into fun shapes is always a crowd pleaser. Top with fresh berries or make this easy and no-sugar-added strawberry syrup. Simply blend strawberries (frozen or fresh) and put in a microwave safe dish. Heat for about 30 seconds and serve hot on top of your favorite pancakes or waffles. Source: Submitted by Abby Forman, RD, Bon Secours Physical Therapy and Sports Performance.